President Donald Trump faces a deadline in a few weeks to extend waivers allowing several countries to continue importing Iranian oil. The Trump administration's goal is to drive Iran's oil shipments to zero through tough sanctions. Oil market supply is getting tighter, making it harder for Trump to choke off Iran's shipments without sending crude prices higher. Just one month ago, President Donald Trump's top envoy for Iran told a major energy conference that oil market conditions are making it easier to choke off the Islamic Republic's crude exports without causing a price spike. "When you have a better supplied oil market, it allows us to accelerate our path to zero," U.S. Special Representative for Iran Brian Hook said at CERAWeek by IHS Markit in Houston. 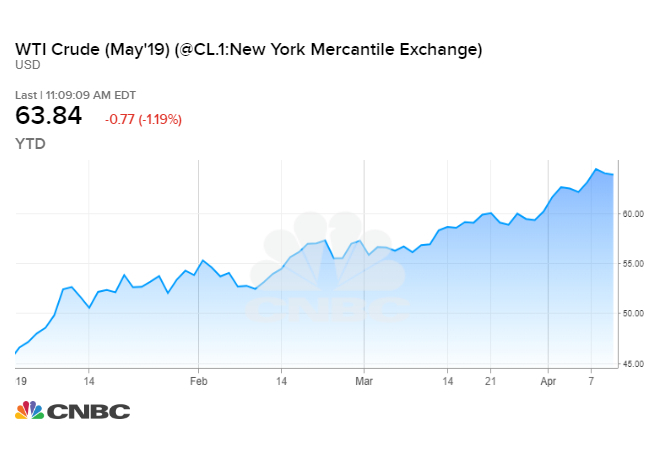 Since then, the cost of U.S. crude oil has jumped 12%, international Brent crude is trading above $70 a barrel, and the national average gasoline price is up 30 cents a gallon. On Thursday, the International Energy Agency said global oil supplies are tightening in the second quarter as OPEC and its allies slash production and U.S. sanctions on Iran and Venezuela look increasingly effective. "Tightness in the oil market, however, is not just a supply story. In recent months, the resilience of demand has received less attention than the vicissitudes of production, but it is very important too," said IEA, a Paris-based energy policy adviser. 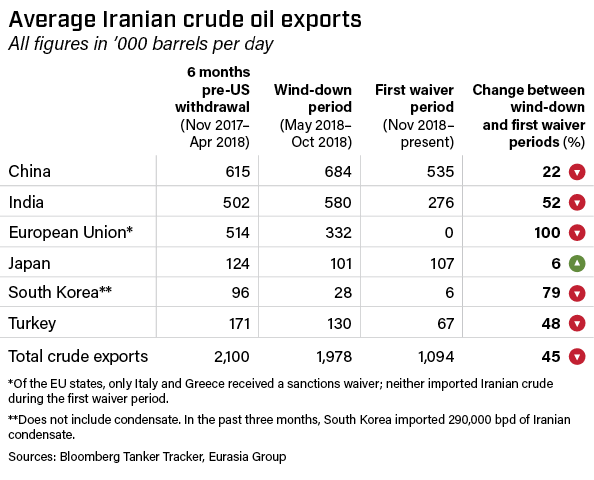 That tightening will make it more difficult for Trump to justify significantly curtailing Iran's crude shipments next month. In just a few weeks, the president must decide whether to extend waivers that allow several countries to import oil from Iran, which is under wide-ranging U.S. economic sanctions. To be sure, analysts doubt Trump will refuse to extend the waivers, despite administration officials repeatedly invoking the administration's goal of driving Iran's oil exports to zero. On Wednesday, Secretary of State Mike Pompeo — pressed by Sen. Ted Cruz, R-TX, to stop issuing the waivers — appeared to indicate that the move is not imminent. "I think we've been clear about our objective of getting Iran to zero just as quickly as we possibly can, and we will continue to do that," Pompeo said during a Senate Foreign Relations Committee hearing. But the question remains how much crude the Trump administration will allow to flow to countries like China and India. While the Trump administration has a "maximum pressure" policy towards Iran, the president says he issued waivers to eight countries in November in order to prevent oil prices from soaring. The exemptions are also seen as a way of managing relationships with foreign countries, most of whom oppose Trump's Iran policy. Ahead of his next waiver deadline, Brent and U.S. crude are up 32% and 40%, respectively, and oil market conditions are pointing to more upside. OPEC's oil production plunged to a four-year low in March, and unlike last year, the 14-nation group is ignoring Trump's pleas to hike output and tamp down prices. Top exporter Saudi Arabia says it will continue to pump well below 10 million barrels per day, down from a record 11.1 million bpd in November. Meanwhile, new threats are emerging in key oil producing nations. Under pressure from ongoing political and economic crisis, U.S. sanctions and widespread blackouts, Venezuela's output plunged to a 74-year low in March. Libya is on the brink of full-scale civil war, and political unrest has unsettled neighboring Algeria. Those and other factors led RBC Capital Markets to raise its 2019 price target on Brent to $75 a barrel. The investment bank noted that bellwether barrels from the North Sea and West Africa are having a relatively easy time finding buyers. "This is the foremost indicator to watch as a leading guide for signs of market sloppiness or tightness," RBC analysts said in a research note. They called the trend "a surefire sign that the market is well balanced." Risk consultancy Eurasia Group thinks Trump will extend the waivers for the five countries that took advantage of the exemptions to import Iranian crude over the last six months. The waivers are likely to expire for the three countries that did not buy Iranian crude during the period. That should knock Iran's crude shipments down to about 900,000 bpd to 1.1 million bpd through the next six-month waiver period.